U.S. Sen. Roger Wicker (R-Miss. ), chairman of the Subcommittee on Communications, Technology, Innovation, and the Internet, convened a hearing titled “Advancing the Internet of Things in Rural America,” on November 7, 2017. The hearing examined the use and benefits of the Internet of Things (IoT) in rural communities, and the infrastructure needs necessary to advance the IoT market to ensure rural America has access to products and devices that are driving the digital economy. Below are links to the senate hearing, NDIA’s written testimony, and other news sources that have addressed the hearing. On the hearing page, you will find the written statements of the witness panel and the full video of the hearing. 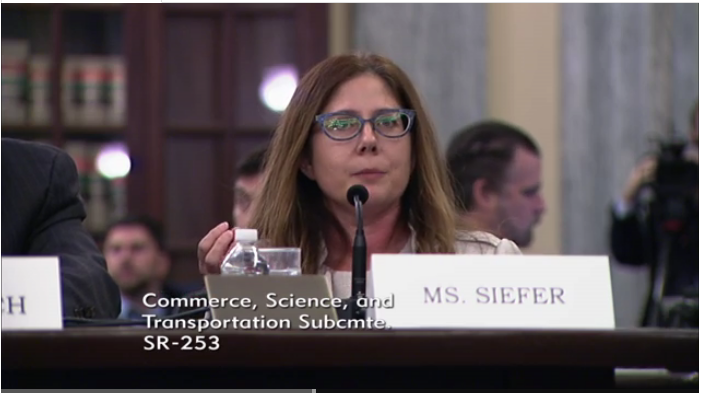 Angela Siefer was the only consumer representative testifying. Angela’s testimony is at 01:01:20, and an interesting exchange between her and Senator Wicker begins at 2:08:40. In a Nov. 7 hearing to examine advancing the use of the internet of things in rural communities, testimony focused on a more fundamental issue — widespread broadband deployment. Siefer urged the Federal Communications Commission to provide more accurate data on what areas had reliable access to the broadband internet. Additionally, the FCC’s recent lowering of baseline upload and download speeds in its definition for broadband, she said, would artificially inflate the progress being made on broadband expansion. Siefer’s organization represents community organizations that seek to reduce digital disparities. In addition to connectivity, adoption is key, said Angela Siefer, director of the National Digital Inclusion Alliance. She said she would like to say there was a federal broadband adoption program, but there isn’t. To actually help people get broadband, the government must adopt an “organized federal strategy,” said Angela Siefer, executive director of the National Digital Inclusion Alliance. Siefer has personally seen the effects of remote monitoring, as it helped her father in the last years of his life. The VA provided the connected device he used to monitor his breathing. Angela Siefer from the National Digital Inclusion Alliance questioned if that private sector investment is doing enough to increase access and she’s said she is critical of leaders for not having a unified strategy. “So there’s a handful of programs for infrastructure, federal programs, I can tell you there are no functioning broadband adoption programs right now. I would like to tell you otherwise, but that’s not true,” Siefer said.